Great Camera strap!! I have one on my K-1. An interesting little packaged which was delivered by Canada Post on a Sunday. I burned out the fungus (none internal) on the lens with hydrogen peroxide. However, I may need to use some ammonia to eliminate the "shadow" of the fungus on the glass. ever sent anyone to fetch a left handed monkey wrench, an idiot stick, a length of shore line or a pail of steam ? Congratulations, nice lens. It has good reviews on the Forum: Mamiya Sekor / Yashinon Tomioka 60mm f2.8 Macro Lens Reviews - Miscellaneous Lenses - Pentax Lens Review Database Good luck and happy shooting! thank you - it's going to be a good year, this 2019! How about an "I almost acquired....."? On the website for the local camera dealers they have a "pre-owned" section, and looking it through it last week I spotted they had listed a Tamron 35080 f2.8 SP macro lens which said it suited Pentax. 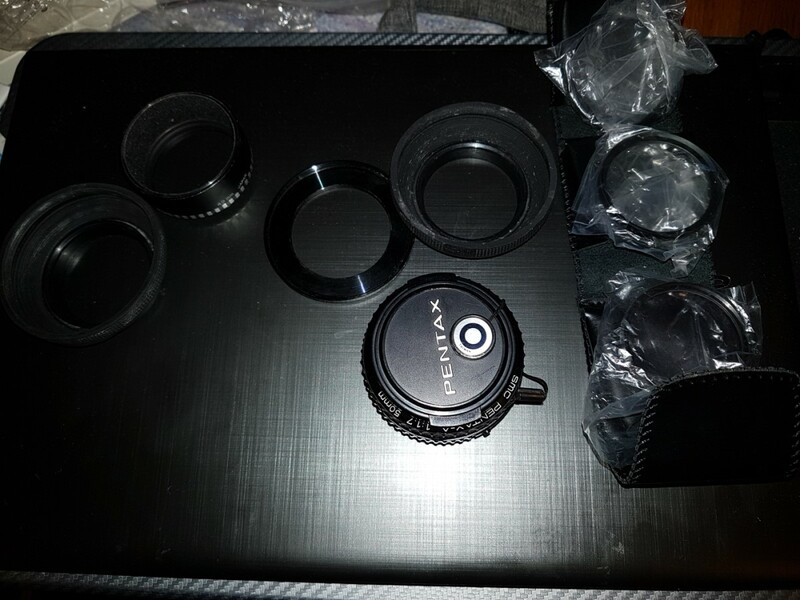 These were one of the Adaptall lenses that you purchased the camera mount seperately to the lens so you could use it over different bodies. Anyway I went into the shop at crack of sparrows yesterday, the nice bloke behind the counter got the lens and although it looked in good condition it just would not fit on the K100D body I'd taken with me. It seemed to have trouble aligning and then it would only turn a short distance before stopping, so it would not lock into place. It's a shame as it was a bargain price and would have been a great manual lens for what I was planning to do, but I wan't going to risk it. it just would not fit on the K100D body I'd taken with me. It seemed to have trouble aligning and then it would only turn a short distance before stopping, so it would not lock into place. I bet it was actually a nikon mount. That is exactly how they are on a Pentax. Did it have a generous flange near the aperture activating lever? This can also prevent mounting on recent bodies. But can be modified or removed completely. I don't know how much an Adaptall adaptor would be for the Pentax, but for a lens costing less than a $100 searching and finding the correct mount would add time and cost. To be honest I was only taking a passing interest, so I don't think I'll be going back. On another topic I picked up a second hand Sigma 28-90 macro lens this morning from a local "we'll buy your stuff off you for cash" chain store. $60 and it really just needs a bit of a clean, although I was looking at another lens they had (Tokina 60-300) but again this one didn't want to fit on the K100D body and had a dodgy aperture movement. Perhaps it's worth starting a thread on purchasing second hand lenses, things to look out for etc. Alternatively do we have a thread with more information on lens mounts and why they don't want to fit. The Tokina had markings on the body end and cap of "SA / PfK" as does the Sigma that I ended up getting. Got a local camera store gift card for Xmas from my son and bought with the proceeds...a B+W UV F Pro glass filter for my Xmas gift lens from my lovely wife...the Pentax DF A 100. I repeat 100mm, not 1000mm ...Macro lens. With the funds remaining in the Xmas gift card, I bought a San Disk memory card for the K1.